I’m a sucker for anything fashionable and yes, shiny. But you can’t call me a magpie because I don’t steal, lol.. You know, a bird specie who likes all things shiny and steals them, put them in their nests.. 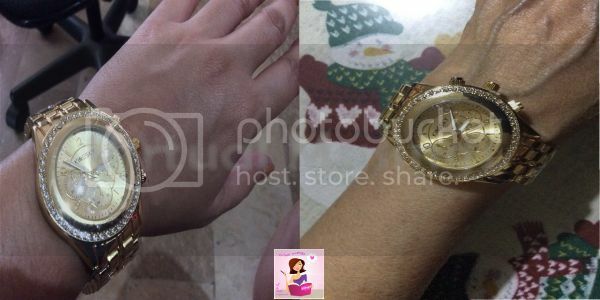 Anyway, here’s a new post about my new “shiny” fave, the Waterproof Rhinestone Alloy Quartz Multi-Movement Wrist Watch I got for review from tmart.com. Of all the watches I’ve reviewed from Tmart, this Bronze Pink Waterproof Rhinestone Alloy Quartz Multi-Movement Wrist Watch by far is my fave. Not only does it glistens but the design is simply amazing. It’s also a Unisex watch so my husband tried it but since he doesn’t fancy this much glitter, he’s not interested in wearing them. It’s quite heavy actually for a woman with a small frame but perfect for my physique. Looks and feels like a real 24K gold watch and if you’re someone who doesn’t know how to distinguish one from the true and expensive signature watches, you’ll think this charming wrist watch costs a fortune. The rhinestones sparkle in the light and will surely make heads turn. Not something you will wear while walking in dark alleys, though, lol. Can be worn either with casual clothes or formal attire. It’s how you carry it that matters. My dad’s birthday is coming up, so I decided to give him the watch as a gift. He tried it while he was here at my house and you can check the 2nd inset photo above for a man’s version. This watch is a perfect gift for your loved ones. If you are in the market for something like this, you can check out the site and the wide variety of products Tmart has to offer. Huge discounts are available plus FREE SHIPPING WORLDWIDE! I’m pretty sure you’ll have an item or two in the checkout cart when you’re done 🙂 Enjoy browsing and shopping!